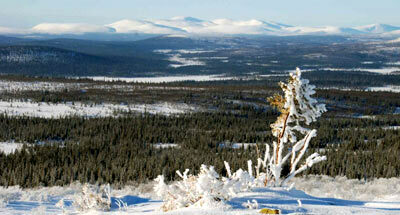 Zapovednik Laplandsky is situated in the Murmanskaya Region. 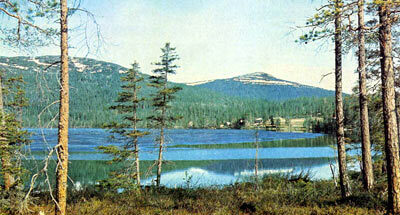 The Zapovednik was established in 1930. Its area is 278.4 thousand ha. The Zapovednik acquired its present-day boundaries in 1983. 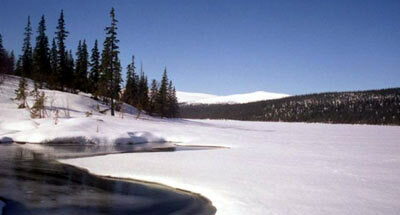 It is situated in the west of the Kola Peninsula (beyond the Arctic Circle) in the basin of Lake Imandra. It includes the mountain massifs Monchetundra and Chunatundra. The relief is mountainous, the highest elevation being 1115 m above the sea level. The forests of pine, spruce, birch reach the elevation of 300-400 m, and higher they are replaced by elfin woodland and thickets of the dwarf birch. The alpine zone represents lichen tundra and occasional low-grass meadows. The upper part of mountains is the rocky "cold desert". Woodland accounts for 52% of the area; tundras, 26%; mires, 10%; water bodies, 4%. The flora contains 422 vascular plants species, five of which being listed in the Red Data Book of the Russian Federation, including Cotoneaster cinnobannus, Calypso bulbosa, spurred coral root, etc. Insectivorous plants are widely distributed: common sundew, English sundew, Alpine butterwort, common butterwort, and bladderworts. Among the mammal dwellers are: the wild reindeer, moose, wild boar, red fox, brown bear, ermine, blue hare, the rare species are the wolf and wolverine. The muskrat has been acclimatized, and beaver re-acclimatized. Tetraonidae are widely distributed, including the capercaillie, black grouse, hazel grouse, whooper swan, bean goose, river and diving ducks — goldeneye, mergansers have their nesting grounds in the Zapovednik. The raptors are: goshawk, sparrow hawk, and among the rare birds are osprey, white-tailed eagle, hawk owl, Arctic falcon, golden eagle. Fish fauna includes 15 species, 6 of which Salmonidae. There are archeological sites (remains of pits for catching deer, sacral stones — "seides". The effluents of the Severonikel Integrated Plant exert detrimental impact on the Zapovednik nature. This explains why the main trend of research in the Zapovednik is assessment of ecosystem status. 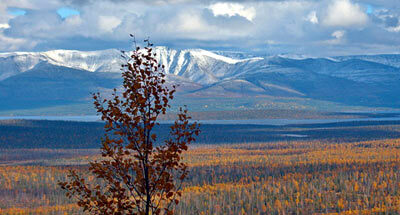 The Zapovednik has the status of Biosphere Reserve.